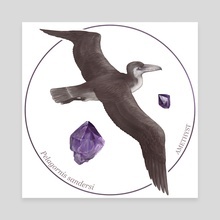 Pelagornis sandersi with amethyst by Alisa B.
Pelagornis sandersi is an extinct bird from about 25 million years ago with the largest estimated wingspan of all known birds so far (~6.4 meters)! Amethyst is the official state gemstone of South Carolina where the one fossil of P. sandersi has been found. I looked at skeletal and artist reconstructions for reference, as well as photos of the wandering albatross, which has the largest wingspan of any living bird today (~3 meters). 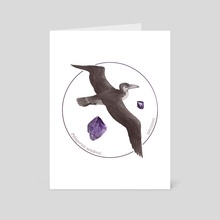 Based on its characteristics, P. sandersi is thought to have used wind currents extensively and stayed close to the ocean like the albatross.